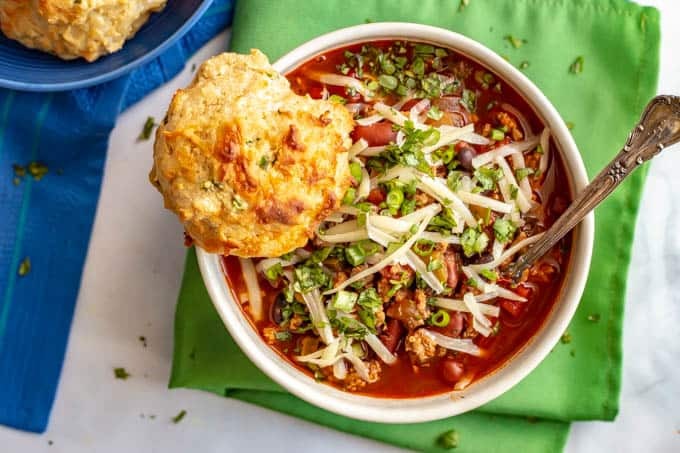 The best game day chili is loaded with ground turkey and beef, two kinds of beans, tomatoes and the perfect blend of spices for an easy, but rich and satisfying chili. Everyone will be going back for seconds! Have you guys been hit with the crazy winter weather this week? We had a cold snap here in North Carolina but it so pales in comparison that I felt a little guilty anytime I shivered. Not to worry though, I’ve got a super cozy meal today to warm us up! 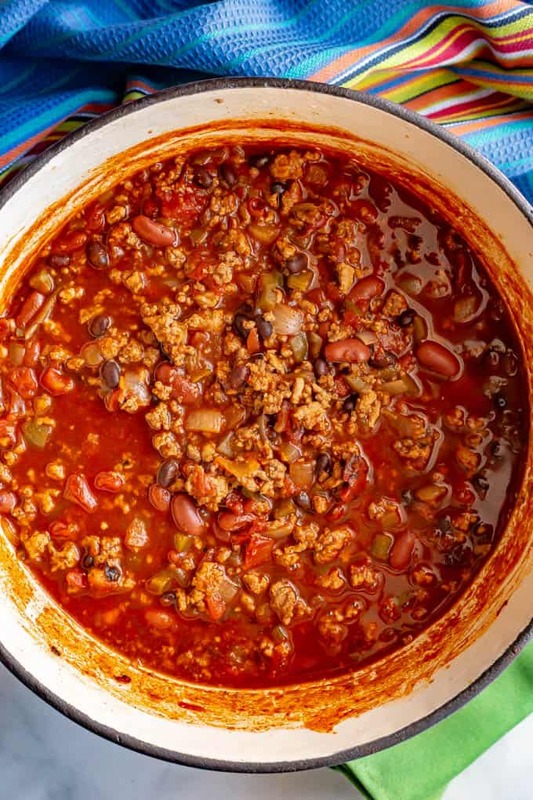 Anyone else think they could survive the fall and winter months by eating nothing but chili? Plus, you’ve got access to toppings galore, which is always a selling point in my book. And you can pair it with all manner of delicious breads and biscuits. Today though, we’re getting serious about our chili. We’re going big and we’re going bold. I made this a few times last year and finally got it just right on, you guessed it, Super Bowl Sunday. My husband raved about it. He went back for seconds. Then he went back for THIRDS! That never happens, my friends. That’s how I knew this was just where I wanted it to be. I think he was worried that I wouldn’t make it back-to-back weeks. Silly guy. Of course I’m going to make it again for the big game! 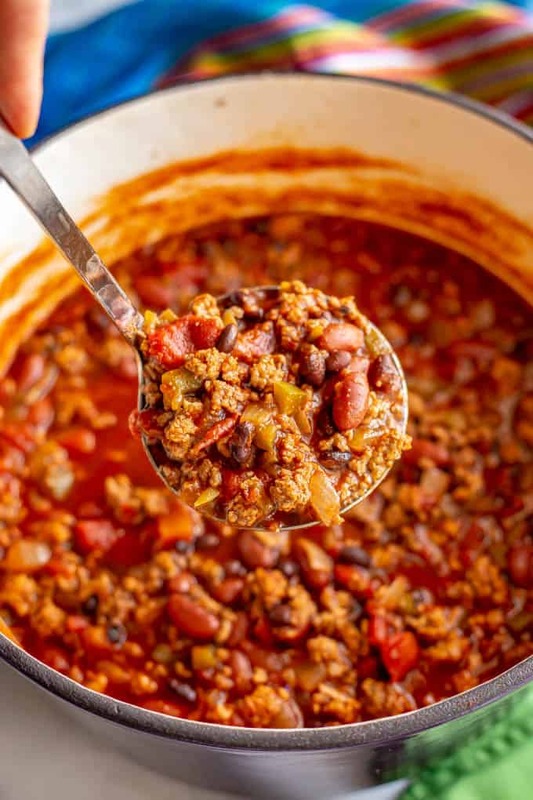 This chili is loaded with two kinds of ground meat, two kinds of beans, plenty of richness from the tomatoes, a ton of depth from the beer and Worcestershire sauce and just the right blend of spices to bring it all together. Plus, you don’t have to cook it all day! This is easily ready in under an hour and doesn’t take much hands-on time. And because of all those heavy-hitting ingredients, you get that all-day, slow-cooked, crazy rich and flavorful result. Just without ALL that time or effort. Gotta love that! I use lean ground turkey and lean ground beef, but you could also substitute pork for the beef. You’ll need about 1 3/4 to 2 pounds of meat all together. I use black beans and light red kidney beans, as those are our favorites. Feel free to use your favorite beans here. I love the extra depth of flavor you get from having beer cooked into chili. However, you can substitute more low-sodium chicken broth or beef broth if you prefer. 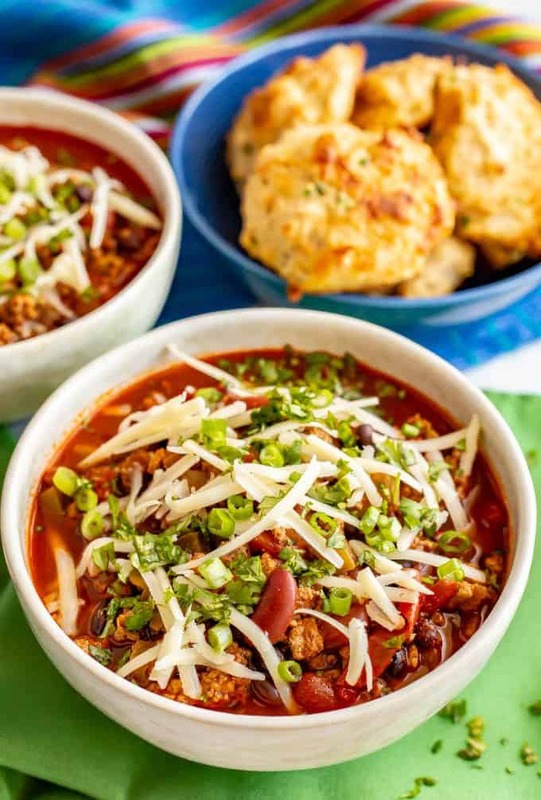 Want to make this a gluten-free chili? Just use a gluten-free beer or substitute broth for the beer and you’ll be all set. 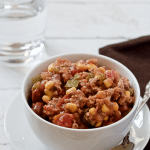 This chili keeps well in the fridge and freezes great too, if you have leftovers. 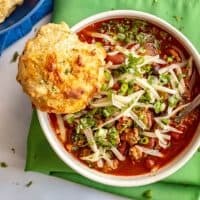 Finally, I love a thick chili and this one gets to just the right consistency for me. 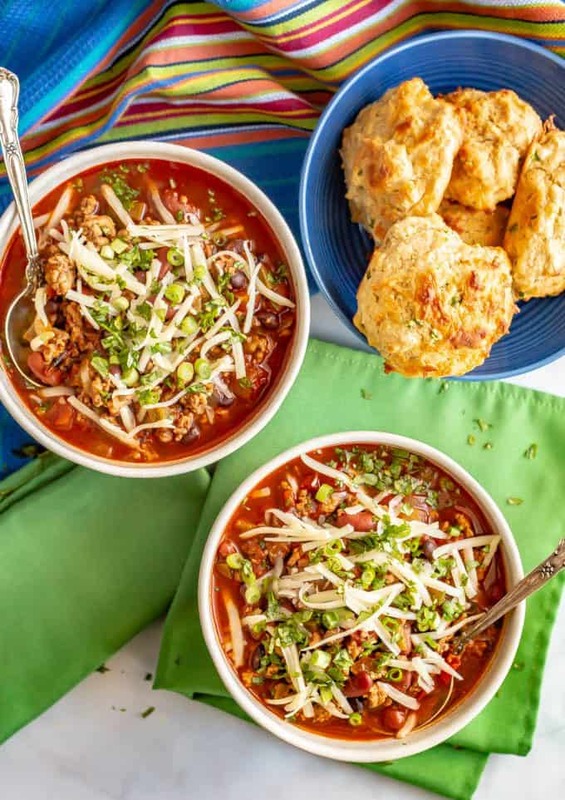 Depending on your heat level and how long you let it simmer, you may want to add some additional broth to thin it out or get it to your liking. And don’t forget the toppings! Definitely don’t forget the toppings! We also love serving this with some sort of delicious bread. Or try my easy cheesy cornbread muffins. They’re always a hit and are super quick and easy to make. 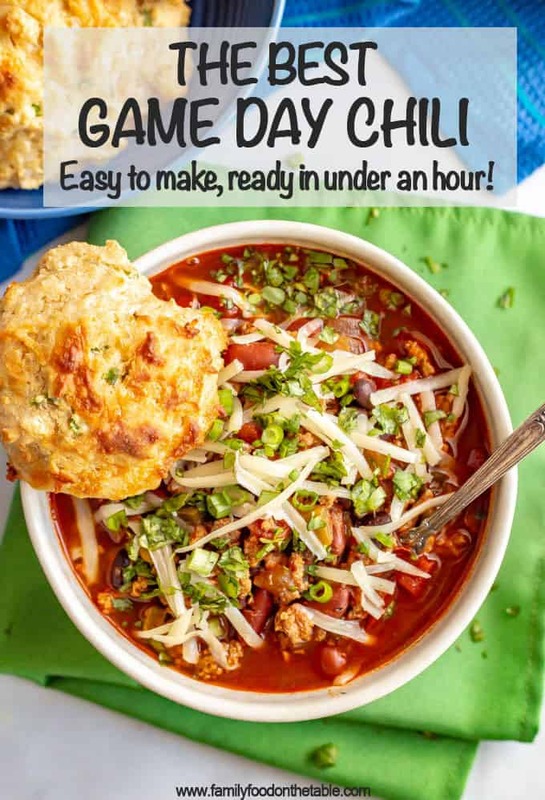 I hope you enjoy the big game this weekend and I hope you have a big ‘ole bowl of warm chili, loaded with your favorite toppings, to keep you company. P.S. Got leftovers? You’ll want to make my loaded chili stuffed baked potatoes – they are so delicious! 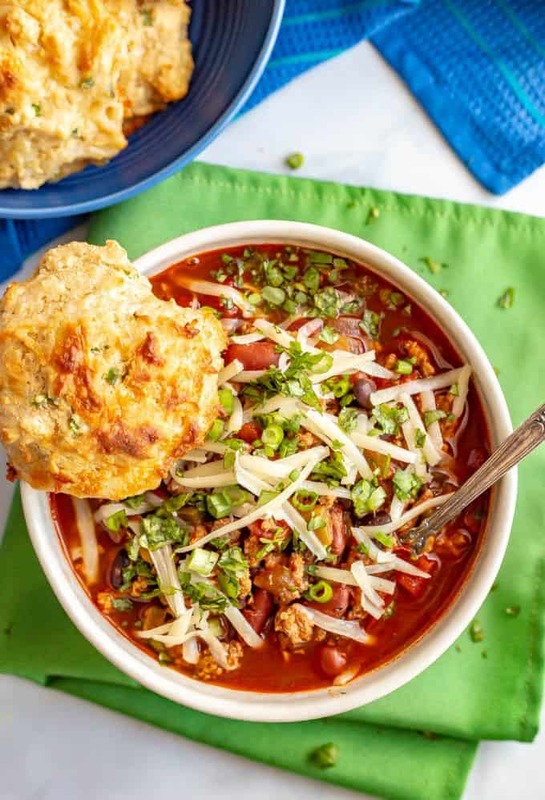 The best game day chili is loaded with ground turkey and beef, beans, tomatoes and the perfect blend of spices for an easy, but rich and satisfying chili. 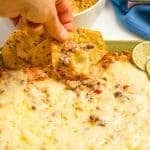 Shredded cheddar or Monterey Jack cheese, diced avocado, chopped fresh cilantro, sliced green onions, sour cream or Greek yogurt, hot sauce, crackers or tortilla chips, etc. Heat a large pot or stock pot over medium high heat. Add ground turkey and pork/beef and season with a few pinches of salt and pepper. Cook, breaking it up with a spatula or spoon, until the meat is browned and cooked through. Transfer the meat to a bowl and drain any excess liquid from the pot. Reduce heat to medium and add olive oil. Add onions and peppers and sauté for 4-5 minutes, until softened, stirring occasionally. Add garlic and cook an additional 30 seconds. Add the chili powder, cumin, paprika, salt and cayenne, if using. Stir well to coat. 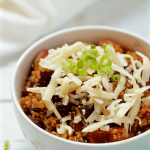 Serve warm with desired toppings and enjoy! I use lean ground turkey and lean ground beef, but you could also substitute pork for the beef. You’ll need about 1 3/4 to 2 pounds total of meat. I love the extra depth of flavor you get from having beer cooked into chili. However, you can substitute extra low-sodium chicken broth or beef broth if you prefer.